Toolbars in Unified Service Desk (USD) can be used to great effect to enhance the capabilities of a USD application. This post will focus on some of the concepts / variations possible. Toolbar can be placed in three positions in USD, as demonstrated in the picture above. Above you will see the CRM and Search options in the “main” toolbar. Within USD this is called the ToolbarPanel. 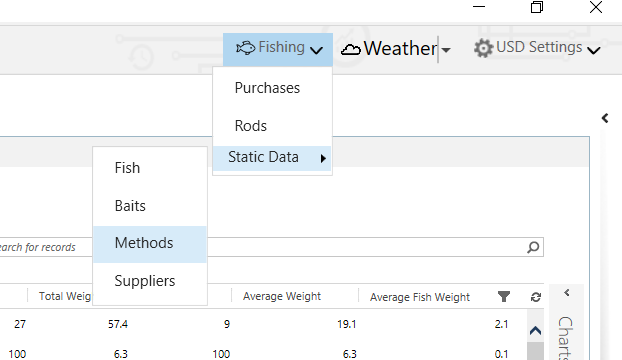 You will also see Fishing, Weather and USD Settings in what is called the AboutPanel. And finally notice the third position in the Search tab which contains the options Accounts, Contacts and Fishing Locations. Prior to creating any toolbars you’ll need to create a couple of hosted controls. One will act as a container for the “main” toolbar and one for the about toolbar. In CRM settings, under Unified Service Desk find the hosted controls area and simply add two new hosted controls similar to those below. Notice how the display panel is set to either “ToolbarPanel” or “AboutPanel”, this option dictates the position of the toolbar. Toolbar options can be found “surprisingly” in the toolbars area of the Unified Service Desk settings. Creating a toolbar is simple, all you need to do is create the toolbar, associate it with an appropriate hosted control and then add any buttons / actions you require. Below you can see that I have added to toolbar called main, once saved you can navigate to the hosted controls option and use the add existing option to associate the toolbar with a suitable container. In this case I have selected a hosted control called “Toolbar Container”. Lets begin by looking at some of the “main” options on a toolbar. We’ll then move onto looking at buttons / actions. Name: Set the name to anything logical to describe your toolbar, this setting is not seen by users. Title: The title is optional. To be honest I tend not to use it, but if you do enter a title this will name the toolbar on the screen. I’ve shown an example of how this might l. Notice the word “MAIN” at the start of the toolbar. This cannot be clicked on and personally I feel serves little / no purpose. Hence I tend not to use this option. Order: You’ll see that I have left the order field blank, in this context I don’t believe the order field has any significance. Although later you will see that the order field does have a meaning on the toolbar buttons. Name: The name of the toolbar isn’t shown to the users, therefore use any logical name you like. Image: This is the name of an image file that can be used to display an icon on the toolbar. Sometimes I find I only have an image and feel no need to set the button text. Any image you use will need to have been added as a web resource under CRM customizations. Searching the existing web resources should help you to find some existing icons which may be useful but you can also upload your own. In my example below my button is called “weather” so I have uploaded an icon that looks like a cloud. Button Text: The button text is shown in the toolbar as the name of the button. As already mentioned this attribute is optional and I often leave blank preferring to have just an image. Order: The order is significant here. As it drives the order the buttons will show within your toolbar. One tip here might be to avoid numbering your buttons 1,2,3,4 etc. A better solution might be 10,20,30,40 etc. As this gives scope for you to insert additional buttons later without having to renumber the existing ones. Tooltip: The tooltip will display when the user hovers the mouse pointer over the button. This is an optional field. Show Tab: The show tab is an optional field which you may not need to set. The concept here is this field is set to the name of the hosted control (tab) that will get focus when the button is clicked. Having created your toolbar and added a button you’ll want to link it to one (or more actions), this is simply done by adding the actions to the buttons. Typically the action will be an action call to display a tab containing a CRM page or webpage. You’ll find details on how to create actions of this type in a variety of my other posts. Below I have shown an example of a multi-level toolbar menu. Creating this type of effect is easy! First add your toolbar, then add the “top level” button(s). Then from that button select the “Toolbar Buttons” option in the navigation and add the next layer of buttons. Then (if required) on a button on the second layer you can use the “Toolbar Buttons” option again to add a second layer and so on …. One tip here is sometimes you might still add an action to the top level button. For example, in my AboutPanel I have a button called “USD Settings”. Under this I have two options, “About” and “Debugger”. I have still associated the action to display the debugger with the top level “USD Settings” button. Doing this will mean clicking the “USD Settings” option will load the debugger or clicking its down arrow will show further options. Hopefully this post has been informative and I have covered all of the main aspects connected with toolbar buttons. If anyone spots anything significant missing please let me know and I will add. ← USD – Show associated views.